The spinosaurus was the biggest carnivorous dinosaur and lived millions of years before the tyrannosaurus. The most well-known species of tyrannosaurus is the T-Rex. Over 30 T. rex specimens have been found, some of which are close to complete skeletons. So scientists know a lot more about the T. rex than the spinosaurus, for which there are only six known specimens. Biped or quadruped Bipedal powerful tail allowed it to move quickly; could run up to 25 kmph. Typical walking speed of about 5 mph. Its legs were extremely big and powerful. piscivorous; ate fish, various giant lungfish, giant sawfish. Carnivorous; preyed on armored herbivorous dinosaurs, other T. Rex, scavenged. 6 partial Partial skeleton found in 1902. More than 30 partial Tyrannosaurus specimens have been found since. Over 30 specimens exist. 1912 Teeth from what is now documented as a Tyrannosaurus rex were found in 1874 by Arthur Lakes near Golden, Colorado. Long crocodilian snout, full of straight, conical teeth, nostrils high up the snout. Heavy, thick skull; mouth full of serrated round teeth. Large brain (dinosaur standards) Extremely wide with front facing eyes giving it binocular vison. Spinosaurus is a genus of theropod dinosaur which lived in what is now North Africa, from the lower Albian to lower Cenomanian stages of the Cretaceous period, about 112 to 97 million years ago. Tyrannosaurus is a genus of coelurosaurian theropod dinosaur. T. rex, is one of the most well-represented of the large theropods. Tyrannosaurus lived throughout western North America, on what was then an island continent known as Laramidia. Spinosaurus lived during the lower Albian to lower Cenomanian stages of the Cretaceous period, 112 to 97 million years ago. T. Rex lived during the upper Cretaceous Period, around 67 to 65.5 million years ago. The T. Rex was one of the last species of dinosaurs to exist before mass extinction. Spinosaurus was the largest carnivorous dinosaur; herbivores argentinosaurus and sauroposeidon were probably larger than the spinosaurus. Different estimates have placed the spinosaurus between 12.8 and 18 meters long, and weighing between 7 and 20.9 tonnes. When T. Rexes roamed the earth, they were among the largest dinosaurs on the planet. (By that time, spinosaurus had become extinct.) The largest specimen found is 12.3 meters long and 4 meters tall at the hips. Estimates of its weight have varied from 4.5 tonnes to 7.2 tonnes. The spinosaurus had a long skull with a narrow snout, somewhat like a crocodile. Tall spines grew out of its back vertebrae. These are known as “sails.” Although paleontologists originally believed that spinosaurus walked on two legs, new research has suggested that they walked on four legs, at least occasionally. T. Rex is one of the largest land carnivores that ever lived. It had a short, muscular neck, a huge head, powerful legs, and two short forelimbs with two clawed fingers each. It also had a long, heavy tail to balance out its huge head and torso. Paleontologists are undecided whether the spinosaurus primarily caught animals on land or ate fish. There is also some debate over whether the T. Rex was a predator or purely a scavenger. 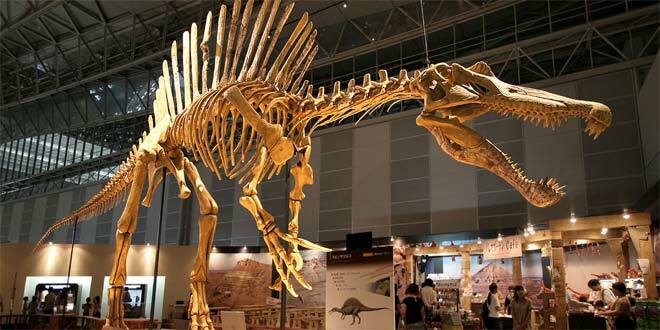 Archaelogists have discovered two types of spinosaurus: spinosaurus aegyptiacus and spinosaurus maroccanus. The first partial remains were found in 1912 by Richard Markgraf in western Egypt. Ernst Stromer published an article naming the spinosaurus in 1915. Additional remains belonging to a second similar species were found in 1934. T. Rex teeth were first found in 1874 by Arthur Lakes in Colorado. The first partial skeleton was found by Barnum Brown in Wyoming in 1900. Brown found a second skeleton in Montana in 1902. T. Rex was named by Henry Fairfield Osborn, president of the American Museum of Natural History, in 1905. One T. Rex track has also been discovered. It was found in New Mexico in 1983. 6 partial specimens of spinosaurus have been found. The first, described by Stromer in 1915, was destroyed in World War II. Other specimens can be found in the Canadian Museum of Nature, the Museum National d’Histoire Naturelle, the Office National des Mines in Tunisia, the University of Chicago Paleontological Collection, and the Museo di Storia Naturale in Milan. The most complete T. Rex specimen contains approximately 85% of the original skeleton, and is named Sue after its discoverer, Sue Hendrickson. Sue was found in South Dakota in 1990 and now resides in the Field Museum of Natural History. 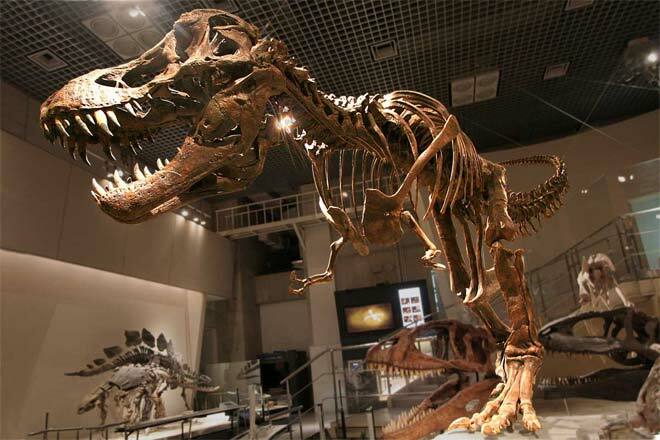 Since its discovery, T. Rex has been one of the most popular dinosaurs in popular culture. It first appeared in the 1918 movie The Ghost of Slumber Mountain, where it faced down Triceratops. The dinosaur appeared again in 1925 in an adaptation of Arthur Conan Doyle’s The Lost World, and in the 1933 movie King Kong. 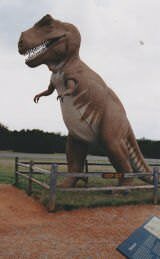 T. Rex also had an iconic appearance in the 1993 movie Jurassic Park, along with its sequels The Lost World and Jurassic Park III. The children’s TV character Barney is also based on the T. Rex. The spinosaurus is also featured in Jurassic Park III, where they are treated as larger and more powerful than T. Rex. The two dinosaurs fight in the movie, with spinosaurus winning. Spinosaurus has also appeared in documentaries such as Bizarre Dinosaurs, Monsters Resurrected and Planet Dinosaur, and can be found on postage stamps in Angola, the Gambia and Tanzania. Both dinosaurs also feature in the video game Primal Carnage (Youtube video).